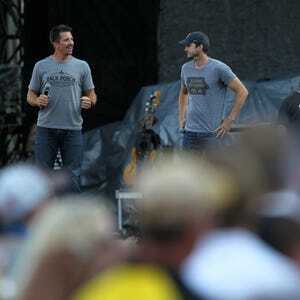 Country fans invaded the landmark football stadium for a day jam-packed with surprises. It may have taken more than 80 years, but live music finally filled the walls of Kinnick Stadium on Saturday. Culminating with a set from country superstar Blake Shelton, the first-ever show at Kinnick provided energetic performances, a few on-stage surprises and, of course, a chance for Hawkeye fans to bust out the tailgate a week before the football season officially kicks off. Shelton — who’s recently issued a publicized apology regarding a series of offensive tweets that surfaced earlier this month — delivered a nearly two-hour headlining set full of laughs, sing-alongs and crowd-favorite hits. Proceeds from ticket sales at the show, titled Back Porch Revival, benefited the Native Fund, a nonprofit launched by Dallas Clark and Ashton Kutcher that aims to aid veterans, children and natural disaster-stricken Iowans. A total 44,636 people attended the event, organizers confirmed on Sept. 1. While Shelton’s time spent between songs was mostly occupied by playful banter, he and his band’s set didn’t pass without a nod to the underlying message of the event. Along with giving the crowd the hits they came to hear (tracks like “Honey Bee,” “Ol’ Red” and “Came Here To Forget” were a few of the many cuts Shelton sawed through), the award-winning singer and “The Voice” host comes off most memorable while interacting with the crowd. He joked, he talked … he even danced a little while guiding the audience through his set. In true Kinnick spirit, Iowans from Carroll to Burlington to Waukee tailgated outside the walls of the stadium, blaring music the likes of Garth Brooks and Guns N’ Roses while grilling and tossing bags. These tailgaters included Ed and Lynne Miner, of Waukee, and Mike and Sue Bailey, also of Waukee. Lynne Miner said she came to the show for a dose of Shelton in real life, while Mike Bailey noted it’s not quite a Hawkeye game. Others, like David Berning of Carroll, came because of what the show represents. Berning said he’s a 40-year Hawkeye season ticket holder. 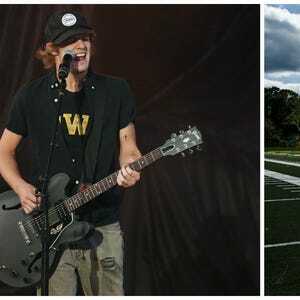 Taking the stage at 5 p.m., Hawkeye fans in the house (and there were plenty of them, chants of “Let’s go Hawks” weren’t uncommon between songs) saw a familiar face take the stage: Tucker Beathard, brother of Iowa quarterback C.J. Beathard. “This is my second home, man,” Tucker Beathard told the early concert-goers. He then dedicated “Rock On” to C.J. Beathard. “We used to get in a lot of stuff growing up but he’s always had my back and I’ve always had his,” Tucker Beathard said. More early evening support came from “Save A Horse, Ride A Cowboy” act Big and Rich. The duo took a portion of their set — which featured everything from original material the likes of “Run Away With You” to a medley cover featuring Don Mclean's “American Pie” and Chumbawamba “I Get Knocked Down” — to acknowledge the military members in the stadium. “We’d like to say thank you for your sacrifice for the United States of America,” John Rich, one-half of Big and Rich, said. After the zealous offerings of Big and Rich came the slick country pop songs of Thomas Rhett. During a cover of Garth Brooks’ fan-favorite hit “Friends In Low Places,” Rhett gave the crowd a dose of Iowa lore that won’t be forgotten in the near future: bringing Ashton Kutcher to the stage for the live-only third verse of the song. "Do the Hawkeyes got my back on this one?" Kutcher exclaimed before diving into the verse. Kutcher and Rhett brought the verse home to roaring approval from the thousands at the stadium. Before Rhett took the stage, Clark took media questions on how the day had unfolded thus far. He related the interview to giving comments about a game at half-time. He and Kutcher took to the Back Porch stage multiple times during the evening to remind the crowd of the Native Fund’s cause. What was it like for the All-American Hawkeye to return to the Kinnick limelight? Shelton mixed the back end of his 22-song set with some of his oldest numbers (“Austin”) and some of his newest material (“She’s Got A Way With Words”). This provided another opportunity for him to ham with the crowd.